Hubble photo of the galactic center reveals colorful stars. The Stars at Night Are Big and Bright … Deep in the Heart of the Milky Way. Sometimes you just need to look at pretty stars. Interestingly, the stars are displayed pretty close to their natural colors. Hubble cameras are equipped with a wide variety of filters that let through light of not just various colors, but also various bandpasses; that is, the range of colors. A narrow bandpass means you’re seeing a very thin slice of colors (say, centered in red), whereas a wide passband lets through light at a bunch of different colors. These filters have various uses; looking at gas clouds, for example, is usually better using narrow bandpasses to isolate the light emitted by specific elements. In this case though, wide bandpasses were used. Specifically what you see displayed as blue is centered at 435 nanometers, which really is blue. Green is actually from a filter at 606 nm, which is closer to yellow-orange, and red is from 814 nm which is very red (technically I’d say it’s near-infrared). But when combined all together, the image is not a bad representation of the actual colors the stars emit. And look at the variety! Blue, yellow, red … the color of a star is due to its temperature. Blue means hot, red means cool. In general you can’t tell the mass of the star without more info; a red star might means it’s a dim red dwarf that’s close by, or a mighty red giant blazing much farther away. It’s not your eyes, it really is dusty in here. Notice anything? Ignore the brighter stars and concentrate on the fainter ones. Can you see they’re mostly red? Now some of that is real; faint red dwarfs are the most common stars in the galaxy. But I have to think that we’re also seeing the effects of dust here. Dust is made up of tiny grains of silicates (like rock) or complex carbon-based molecules called polycyclic aromatic compounds, or PAHs—essentially soot. Both tend to absorb visible light, but not only that, they scatter it. When light hits a teeny grain it bounces off in a random direction. Blue light scatters way better than red light; a star behind some dust will appear red because the blue light is absorbed or scattered away, while the redder light goes straight through. 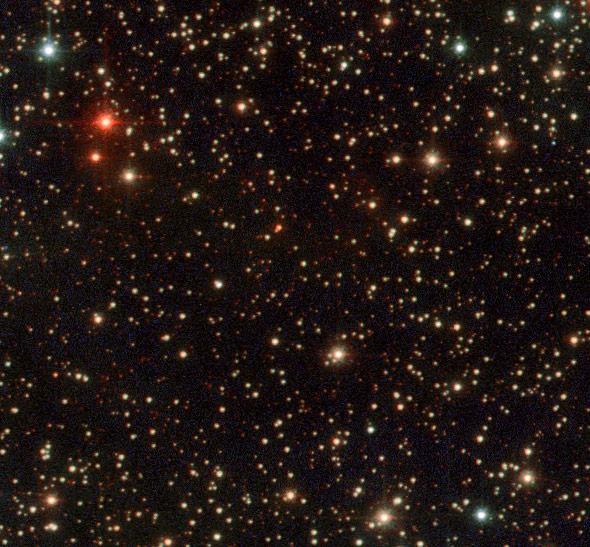 I strongly suspect that’s why so many of those fainter stars look red. They’re almost certainly brighter, bluer stars being affected by dust. This is very common in photos taken of the sky near the galactic center; dust is strewn liberally throughout that region. It’s commonly made in older stars, and stars that explode, and those are more populous toward the heart of the Milky Way. My favorite example of this is the dark cloud Barnard 68, where the material is thin near the edge and thicker toward the center; you can actually see stars getting redder as you look from the edge toward the middle. I talked about this in my Crash Course Astronomy episode about nebulae, too (start at about 3:23 for the whole explanation). As always, I love how astronomy provides both brain candy—beautiful pictures just for looking at— and brain nutrition—science that provides a better understanding of what you’re seeing. Art and science are two sides of the same coin. *These images were not taken primarily for science; while another camera was investigating a cluster of stars nearby, this camera just happened to be pointed at this star field. Scientists don’t like wasting opportunities, so the camera was turned on to see what it could see. This is called taking “parallels,” and when I worked on Hubble I was fascinated by them; I wound up writing a short paper on an object we found in one.